It’s a rumble in the urban jungle at SoMa StrEat Food Park, where luchadores and 10 food trucks will each battle for the title of Best In The Bay. The contest starts at the food trucks with hand-crafted, craving-slaying, breakfast burritos. Take your bite of the action! It’s tots vs. papas, bacon vs. carne asada, and sour cream vs. guacamole, with your taste buds as the judge. Which burrito will go home with the gold foil belt? Vote for your new favorite breakfast burrito, be it veggie and eggy with avo or a carnivore’s spicy chorizo dream. The smackdown continues in the ring, with professional luchadores on the ropes, ready to show the competition their toughest, back-wrenching, cross-flying, body-slamming moves. These masters play to the crowd, so find your outdoor voice with a cold one from the Modelo Especial Michelada Bar, serving a variety of Mexican beers, fresh micheladas, and house-made sangrias all day long. 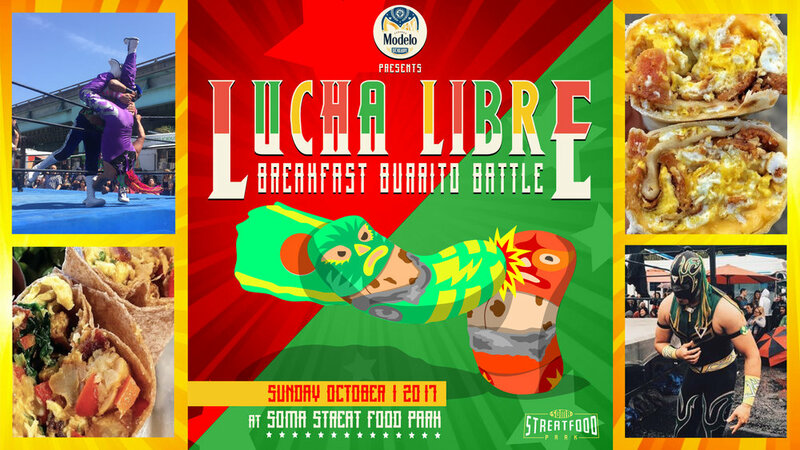 Taste glory at the Modelo Especial Lucha Libre Breakfast Burrito Battle, only at SoMa StrEat Food Park. +Modelo Especial Bar, serving Mexican beer, micheladas, and house-made sangrias! FREE for kids 5 & under! Join the Facebook Event to see food truck list, burrito specials, live updates, and more!